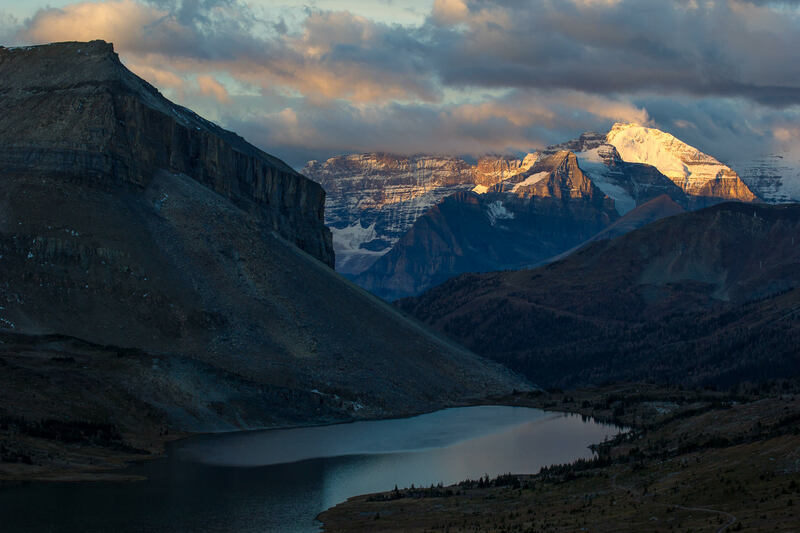 Directions: The start of the hike up to the pass is just off the dead-end road which leads up to the base of the Lake Louise ski area, near Lake Louise Village and with Banff Town a 40 minute drive south. 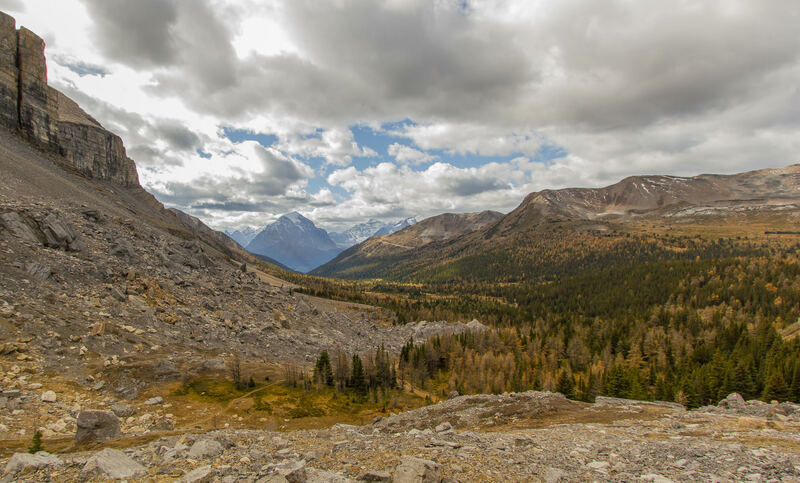 To reach the pass it's a 14km hike up beyond the forest tree line and into a wide mountain basin along a clear path. Here you traverse a lake shoreline, before heading northwards up the steep convex bank of Deception Pass. Due to the exposed nature of the area, navigation is simple if in clear weather. Deception Pass is deep in Banff National Park, Alberta. Banff National Park is famous for its two popular lakes, Lake Louise and Moraine Lake. However, just opposite these tourist hotspots is a vast mountain region which is fairly unknown. 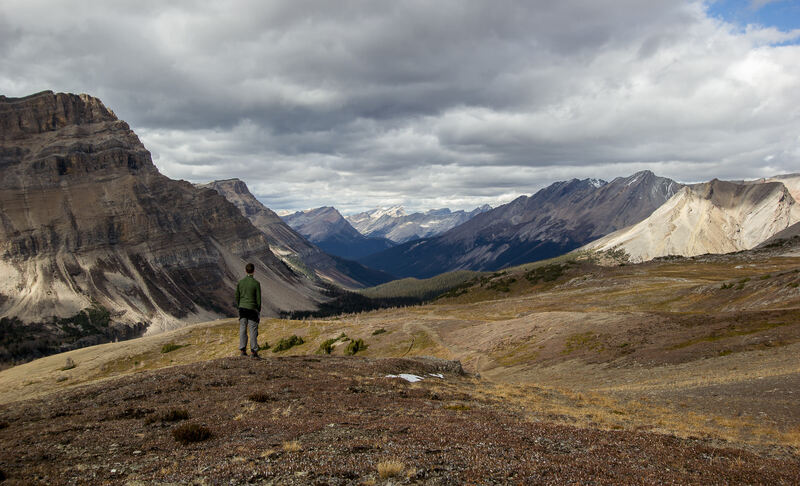 Deception pass is 2485m high and offers dramatic high Rocky Mountain views and views of Skoki Valley. Hiking up through autumnal forests and over into the mountain basin provided a great change of scenery. The landscape higher up is barren, with orange foliage in the late September cold definitely adding to the sense of isolation. 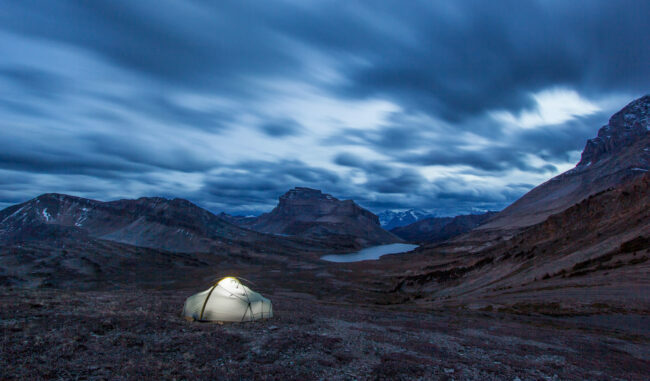 Choosing the best view over a more suitable camp spot, I pitched my tent on a relatively flat area and cooked up a classic dinner of rice and beans. Without a clear night for photography, I chose to capture the moving clouds as the evening turned to night, making for quite a striking scene. Sunrise cast beautiful light over the backwall of Lake Louise in the distance, a vantage point that few visiting would realise existed. Incorporating the bold lines of the rockwalls, typical of mountains in the region, is key here whether at wide-angle or more zoomed. Further, the view back towards the lake from where you walk up and the view into the Skoki Valley provide nice contrast for different style shots, with Skoki Valley being a classic, almost endless succession of leading lines. Any light playing off the rockfaces makes for great photos too.